Ambassador Ryan C. Crocker is dean of the Bush School of Government and Public Service at Texas A&M University – a position from which he had taken a leave of absence to serve as U.S. ambassador to Afghanistan from 2011 to 2012. His is also the James Schlesinger Distinguished Visiting Professor at the University of Virginia. Prior to resuming his position as dean, Ambassador Crocker was a Kissinger Senior Fellow at Yale University. 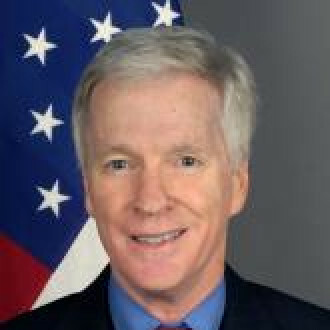 His 37-year career in the Foreign Service included service as U.S. Ambassador to Iraq, Pakistan, Syria, Kuwait, and Lebanon. He is a Member of the Council on Foreign Relations and the Board of Trustees of Whitman College. Ambassador Crocker is a recipient of the Presidential Medal of Freedom, the Presidential Distinguished Service Award, the Secretary of State’s Distinguished Service Award, and the Department of Defense Medal for Distinguished Civilian Service. He earned a B.A. from Whitman College. Crocker served on the Special Committee on the Future of Shortwave Broadcasting, which on August 1, 2014, issued its report, To Be Where the Audience Is; The Future of Shortwave. He was confirmed as member of the Broadcasting Board of Governors on August 1, 2013.